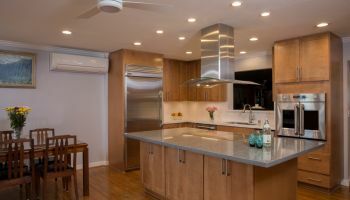 Homeowners Design Center has been helping Hawaii homeowners with their kitchen remodel needs for over 40 years. They've become leading experts in the industry and continue to retain some of the best professionals in the business. They're a complete resource for just about anything a homeowner will need during the planning, purchasing and building phases of their kitchen remodel, including building materials, surface materials, flooring, appliances and of course, access to the professionals. To watch the video and hear kitchen designer Randall Omoto's advice on how to save money on your kitchen remodel, click on the photo below. 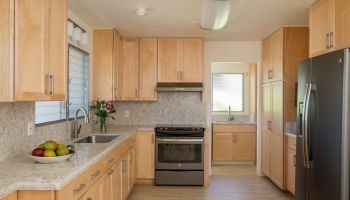 In an effort to help homeowners plan for their kitchen remodel, sales manager Randall Omoto has come up with a series of tips and guidelines to consider as you begin to move forward with your project. Homeowners Design Center has also captured this advice in a series of videos called "How to Save Money on Your Kitchen Remodel". The first video in the series is "There's a Logical Progression". These are extremely useful videos to watch if you're going through your first kitchen remodel, or if it's been 15-20 years since you've done your last one. Also, these are just some tips to consider as you plan your kitchen remodel. To help better plan your renovation, seek professional help for more in-depth advice. Homeowners Design Center is just a phone call away. The very first thing the homeowners should do is start with a budget. Omoto advises, "The very first thing is to start with a budget. The budget is there so then that way you can... complete the (kitchen remodel) without having any financial hardship." The last thing a homeowner wants is to run out of money before the renovation is finished. It also acts as a guideline for a husband and wife to not exceed the agreed upon amount, and if it does exceed that amount then they can have the discussion about whether or not they want to increase the budget. Omoto emphasizes that the budget needs to be an agreed upon amount by the couple. The second thing homeowners should do is make sure they have an objective for the kitchen remodel and write it down. "The second thing we want to take a look at is to make sure that we have an objective (for the kitchen remodel). The objective is there to help create focus. It's there so we can make sure we don't get too far off into left field." Omoto recommends that the objective should be written down so that you can always refer back to it during the remodeling process to ensure that what you're doing is in line with the objective. The third thing homeowners should do is make separate wants and needs lists. The third thing Omoto advises doing is to make a wants and needs list. Omoto oftentimes makes couples make separate wants and needs list because many times a couple looking at the same thing won't always make the same assessment about it. One husband's need can turn out to be what the wife deems as a "want", and even unneeded, as Omoto points out in the video in a recent discussion with his own wife to draw on a humorous parallel. By having a wants and needs list, each couple can review it and decide if something is really a want or a need. You can then refer to your written objective to keep you on pace with getting the things that you want, and ensure that you get the things that you need. The budget, the objective and the wants and needs lists should all be written down so that you can refer to them at any time during the kitchen remodel process. It's advice like this that has made Homeowners Design Center so successful in this business for so long and helping homeowners complete the kitchen remodel of their dreams. To see more projects by Homeowners Design Center, or to find out how they can help you with your kitchen remodel, just click on the images above or anywhere you see the company name.